There is growing concern among the stakeholders of Tuskys Supemarket as the giant chain continue to exhibit signs of a crumbling empire. According to insiders, top executives of the chain have ensured that there are no clear systems and processes to ease business and maximise output and profitability. Top Management led by Dan Githua the CEO, Daniel Ndirangu (CFO) and Wamaitha Mukuha (GM Operations) seems to be in a scheme to siphon money from the supermarket chain and cripple it as they grow their parallel businesses from the Tuskys platform. Before being elevated to the position of CEO, Dan Githua was the Head of Audit in Tuskys for more than 4 years while a key Director Stephen Mukuha was the CEO. Mukuha then had a series of Court cases filed by his other siblings who accused him of swindling more than Ksh 1.6 billion shillings from Tuskys through his subsidiary companies that are the dominant suppliers of Tuskys Supermarkets. A point to remember is that Stephen Mukuha is such a close ally of Dan Githua that when the latter was being thrown off the company by the children of the directors who have gone to school and understood what processes are, it is Mukuha who save Dan and return him to the company. Mukuha pushed him back to the company despite protests by other directors and filed court cases against his returns. CFO Daniel Ndirangu is a beneficiary of the lack of proper systems and also a close confidant to Mukuha. He’s spineless and often too loyal the controlling duo, benefiting from the advantage of having worked for the chain for a period of not less than 10 years. Coupled with that, it will amaze you that Daniel Ndirangu has no working knowledge of any single financial system which can manage and improve the efficiency in the operations of such a giant chain. GM Operations Wamaitha Mukuha is Director Stephen Mukuha’s daughter and a girlfriend of the CFO. Together with the fact that she dropped out of school in Australia, she has no working knowledge to manage a professionally run entity. She is currently in charge of the over 60 branches of Tuskys where she just makes daily calls and get reports of sales while not relying on any single financial system to manage that. All the POS systems in the chains are not connected to a reconciling system. All the managers in the over 60 branches of Tuskys are related to Tuskys directors in one way or the other. They are also illiterate or semi-literate and not able to properly manage the businesses under their car. It’s wholly an archaic manual system of management wherever they are. One common factor in the ownership of Tuskys is that most of the directors are illiterate. One troublesome director who has been a constant nag, taking others to court, Yusuf Mugweru, is known to be completely illiterate and relying only on his fingerprints to sign official matters. He has been suspecting his brothers of defrauding the company for a long time. Yusuf converted to Islam some years back. Realising that he is dealing with naive but rich owners of Tuskys supermarket, Dan Githua devised ways of stealing from the company while completely deceiving the owners. He has ensured that no information systems runs the various arms of the supermarket, relying completely manual system. While still at Tuskys, Dan Githua has started his own Microfinance called Speed Capital that so far has more than 7 branches countrywide. Most of the money looted from Tuskys is channeled to the Microfinance. Githua and CFO Ndirangu are also currently finishing putting up apartments along Kangundo Road built at a cost of not less than Ksh 200 million. A few months back, CEO Dan Githua introduced some internship project at Tuskys which those who look at matters in a shallow manner considered to ingenious. Nothing could be further from the truth. The project was a well crafted scheme to lower the cost of human resource to the company and benefit Dan Githua’s recruitment and outsourcing firm Artemis. Instead of giving the young men and women interns as promised, they are directly posted in branches to work as shop attendants with a gross salary of 15k per month. They are used as cheap labour instead of hiring professional customer care staff with experience. Dan Githua saw the opportunity when the directors launched the internship project under the Joram Kamau Foundation which he didn’t allow to even last for 6 months. After he sabotaged the project under the foundation and sent home the staff in the foundation, Dan Githua saw the opportunity to re-launch the internship under his own company, Artemis. When the chain faced upheavals in 2015, Tuskys owners thought of getting a professional team in place. Dan Githua sabotaged the professionals composed of HR, Marketing, Operations, Communications and ICT professionals. They all left in 2017 because Dan Githua needed no saboteurs in his fraudulent schemes. 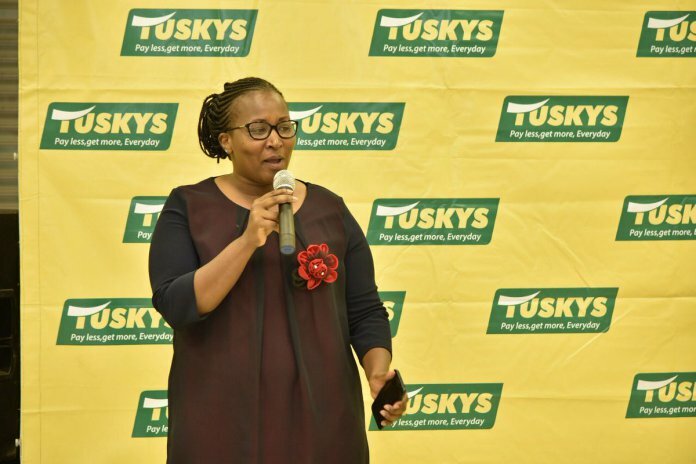 The members of Tuskys Dream Team managers who left include the General Manager Supply Chain Kenneth Karoki, Business Development Manager Zack Mukewa, Customer Experience Manager Collins Agai,Corporate Sales Manager Stephen Ndeto, Chief Operations Officer Major (Rtd) Peter Leparachao, who recently launched the Massmart Supermarket. Others were Marketing Manager Spencer Okach, Security and Control Manager Arthur Church, HR Manager Dorcus Ngaruiya and Loss Prevention Manager Hillary Wachira. With the lack of proper systems at Tuskys, there are frequent reports of orders not being fully delivered or supplies not matching what was ordered. A common report there is a instance when almost half the ordered stock disappeared with the suppliers insisting that they delivered the order while the chain disputing that. There are also many cases where employees fake thefts or robberies so as to hide pilferage. While those in the know agree that some of the members of the Dream Team went rogue and even organised fake robberies to cripple the chain, insiders know that there is a major rot at the supermarket and it will be lucky to last even a year. When Tuskys attempted to take over the management of Nakumatt supermarkets, those in the know realised that Dan Githua was up to some mischevious schemes as Nakumatt had proper structures unlike Tuskys which is being managed on deceits and voodoo management skills. When it goes down, remember that we told you. Time to save Tuskys is now not when it will be down. Previous article20 hot and S3XY PHOTOs of NYS thug, ANN NGIRITA, “Rangi ya thao, rangi ya pesa, EISH! !